Assistive technology, also known as AT, is any device or product that helps a person with a disability perform a task that would otherwise be difficult or impossible. This can include any piece of equipment, product or system that is used to increase, maintain or improve the functional capacities of people with disabilities. AT can be as low-tech as a magnifying glass, or as high-tech as proprietary computer software and hardware. There are several thousand AT solutions available that can provide, and enhance, independence for people with disabilities. In recent years, it has become increasingly common for mainstream software and hardware solutions to also include features and designs that provide access for people with disabilities. There are a number of reasons for this shift. In our daily lives, whether it be for work, school, or leisure, our reliance on electronic access continues to increase at an exponential rate. Electronic access, often coupled with the necessary AT solution(s), can be much more easily accessed by people with disabilities. Take for instance, the ubiquity of emails and texts. Less than 20 years ago, a hand-written letter may have taken the place of an email, and a hastily hand-written message on a scrap of paper shared between two students or colleagues in a classroom or meeting served the same purpose as a text message today. For someone who is blind, someone who has a learning disability such as dyslexia, or someone with ambulatory limitations that would prevent them from physically handling a handwritten letter or note, electronic access coupled with the built-in accessibility features available in most smartphones allow people with disabilities a level of independence and access that could not have been achieved previously. Another recent example of increasingly complex information being digitized with the mainstream population is Facebook’s complex facial recognition algorithms that achieve accuracy rates of up to 98%: Inside Facebook’s Biggest Artificial Intelligence Project Ever. These types of technologies incite legitimate concerns from consumers about privacy issues; however, they also have the potential of providing people with disabilities an unprecedented level of access that would otherwise not exist. For instance, individuals who are blind, have low vision, or who struggle with facial recognition are at a significant disadvantage in actual and virtual environments that involve complex, non-verbal human interactions. Leveraging the mainstream technology that not only provides access to the identity of individuals through facial recognition, but eventually interprets body language and facial expressions, carries with it tremendous potential for people with disabilities. The World Health Organization (WHO) estimates that there are more than one billion people in the world today with disabilities: World Report on Disability. Industry is increasingly recognizing that people with disabilities represent a valuable, and often untapped, market from a financial perspective. Consider Apple, for instance. The company frequently represents the gold standard in accessibility, and is known for “baking in” accessibility at the earliest stages of development. Apple also maintains a strong market share among people with disabilities, largely because of the company’s continued commitment to accessibility. The proliferation of speech input interfaces such as Apple’s Siri, Google Now, and the Amazon Echo allow us to easily request and receive information using speech recognition and speech output. These hands-free and eyes-free solutions also allow greater access for a large number of people with disabilities. In recent years, the Department of Justice (DoJ) has been sending a strong message with its high profile settlements involving educational institutions, industry and government that equal access for people with disabilities is considered a right, not a privilege. For additional information on recent settlements, visit “Legal Settlements” on the AccessGA website. Legislation such as FCC’s Section 255 and the 21st Century Video and Communications Accessibility Act (CVAA) also has a direct impact on telecommunications companies and their commitment to making their products and services accessible to people with disabilities. In the video below, Ramón Corominas demonstrates how a person who is blind and visually impaired accesses content using an iPhone. Ramón originates from Spain, and began his career as a web developer back in 1996. He has extensive experience in the areas of web hosting, web development and web design. He has spent the last 14 years in the area of web accessibility. 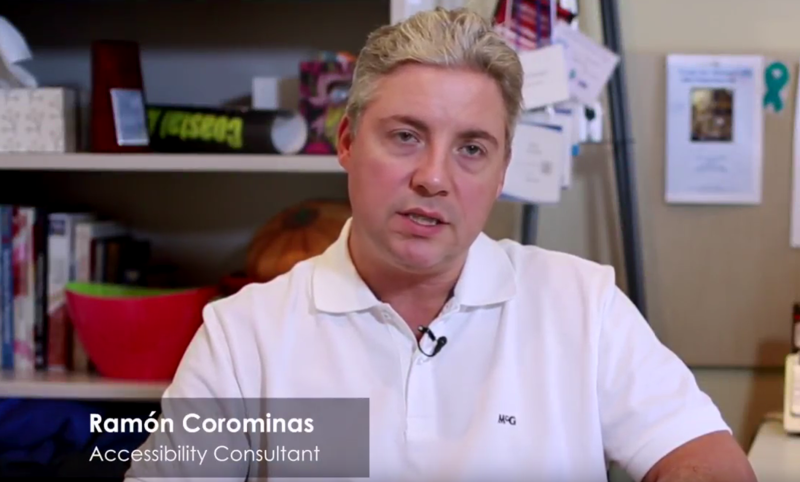 Ramón has a degenerative eye condition called Retinitis Pigmentosa, and understands the importance of web accessibility and assistive technology solutions from first-hand experience. He has served on the Evaluation Task Force of the Worldwide Web Consortium (W3C) to develop a methodology for standardized evaluations of website accessibility. He has also worked for the European Commission. Determining the correct devices or solutions, whether it’s a mainstream device such as an Apple or Android device with built-in text-to-speech and magnification capabilities, or a specialized piece of software or hardware that is needed, requires a thorough assessment. Physical and cognitive abilities, and the specific tasks and goals of individuals with disabilities are all taken into consideration when determining the best AT solution(s). AMAC’s Tools for Life provides comprehensive AT assessments that can help determine the best AT solutions for each individual. The cost of AT solutions can sometime be prohibitive to individuals with disabilities. Credit-Able serves as the alternative financing program for the state of Georgia. Regardless of age or disability. Credit-Able provides small loans of up to $5,000 for all Georgians with disabilities that can be used for acquiring a device, software or other piece of assistive technology. The loan can also be used for home or vehicle modifications. This could include such devices as an iPad with communication apps, a front loading washer and dryer, or a ramp for the home and technology to make computers accessible. Aside from the immediate benefit of getting an item or service that will improve the quality of life of the individual, the recipient of the loan also gets the added benefit of repaired, built or improved credit. For additional information on Credit-Able contact Danny Housley, Assistive Technology Funding and Resource Specialist at Tools for Life at danny.housley@gatfl.gatech.edu or call 404-385-7029. For more information about funding and acquisition of assistive technology visit the Tools for Life website at http://www.gatfl.org and select “funding” to learn about the resources available for people with disabilities in Georgia.